It's been a privilege of mine to work with the team from Global Financial Integrity over the last year or two. Indeed, I'm visiting them in Washington next week. As such it's pleasing to note they've published a new report I've known of for a little while which estimates the annual value of illicit financial flows from all poor nations at approximately $900 million. Titled "Illicit Financial Flows from Developing Countries: 2002-2006," the ground-breaking report shows that the developing world is losing an increasing amount of money through illicit capital flight each year. Moreover, the value of the illicit flows surpasses the amount of Official Development Assistance entering those countries by an order of magnitude. See also the exec summary, and for those who like stats, the full blown thing. Illicit financial flows in the context of this report includes the proceeds from both illicit activities such as corruption (bribery and embezzlement of national wealth), criminal activity, and the proceeds of licit business that become illicit when transported across borders in contravention of applicable laws and regulatory frameworks (most commonly in order to evade payment of taxes). The main methods of estimating illicit flows in this paper involve a combination of the World Bank Residual model and the Trade Mispricing model. The former is intuitively appealing in that source of funds (inflows of capital) which are not matched by recorded use of funds (outflows or expenditures of capital) are considered to be illicit financial flows. Source of funds include types of capital inflows such as increases in net external indebtedness of the public sector and the net flow of foreign direct investment. This paper also utilizes two alternative measures of net external indebtedness of the public sector, one based on changes in the stock of external debt (CED) and the other on the net debt flows (NDF). Use of funds includes the current account deficit (that is financed by the capital account flows) and additions to reserves. In this broad macroeconomic framework, outward illicit flows exist when the source of funds exceeds the use of funds, and vice-versa for inward illicit financial flows. The second method attempts to capture illicit flows through trade mispricing. 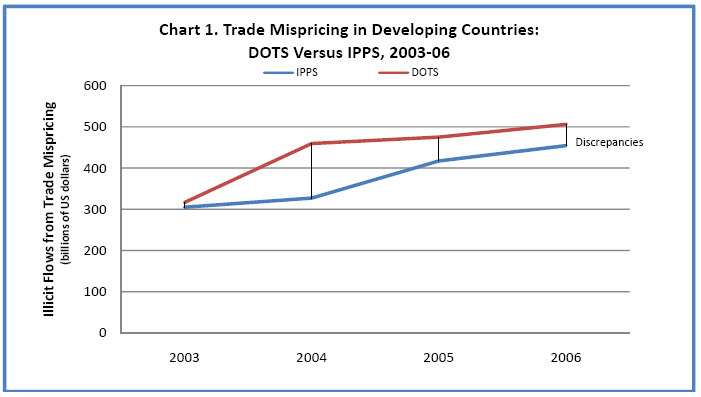 Researchers have long recognized trade mispricing as a major conduit for illicit financial flows. By over-invoicing imports and under-invoicing exports wealth can be accumulated outside the jurisdiction where it was earned (i.e. illicit financial flows). 3) Mispriced asset swaps, where ownership of commodities, shares, and properties are traded without a cash flow. We hope to include more of these omissions in future studies. However looked at the result is that at least half of the illicitly flows relate to deliberate transfer mispricing, much of which I'll tell you we think happens in tax havens. The accountancy profession knows about this. And the loss from trade mispricing is, without doubt, well over four times total aid flows to developing countries - which amount to about $100 billion a year right now. The accountancy profession could stop this happening. It could transform the lives of people in the developing world. Why isn't it doing it? It's a very big question and it needs an answer.